Cat on a hot tin roof by any chance? Well, tiled, but close enough! Ooh nooo, is that cat stuck? Hope it got down ok! Don’t worry – she’s not stuck, just showing off! Real cat or one of those ‘fake cats’ people stick on their roof? That made me laugh. Do people really do that?! This one is definitely real – and a bit of an attention seeker. Gorgeous puss – looks a bit like one of mine. Is it a burmese? So a vet friend tells me. They are gorgeous, aren’t they? There’s loads of them in this area, many semi-feral. I keep thinking I see our cat all over the place as they are all so similar looking! That’s a good guard cat on the look out there. Just what every household needs! The mice are for the owl OK kitty?? Ha! You’re on to her Emma. Although I’m not entirely sure whether she’s after the mice or the owl itself. She’s a fierce little thing. She’s positioned above the hole in the eaves where the owl enters and exits. Lovely picture. Is she yours? Sky and house are same colour. 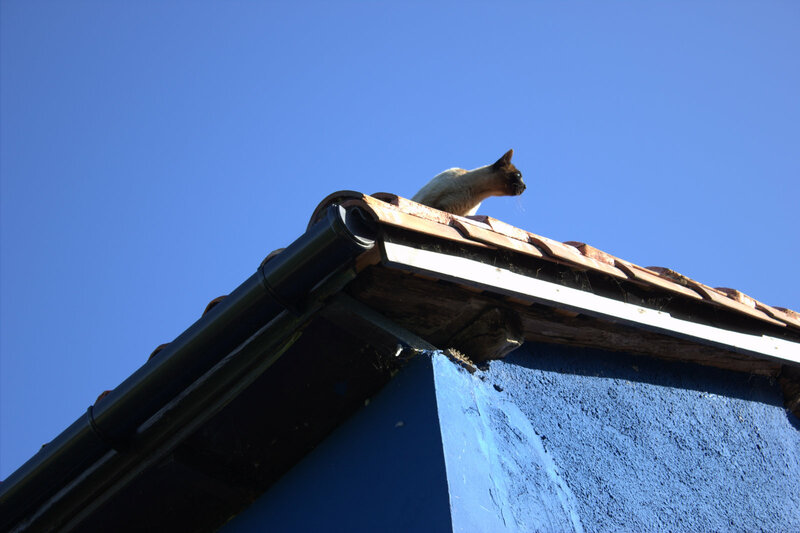 ignoring the cat – oh my gosh that sky is so blue am jealous! Oh no! Did the cat get down? Looks like she is eyeing up a passing mouse!